Introduction to Wireless Billing explains billing system operation for wireless systems, how these billing systems are a bit different than traditional billing systems, and how these systems are changing to permit billing of non-traditional products and services. This figure shows an overview of a billing and customer care system that is used for wireless communication services. 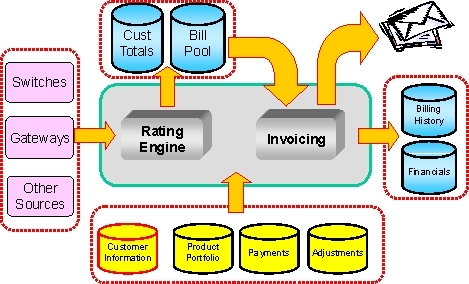 This diagram shows the key billing steps. First, the network records events that contain usage information (for example, connection date and time, call destination, call duration or data volume) that is related to a specific event. Next, these events are combined and reformatted into a single call detail record (CDR). Because these events only contain network usage information, the identity of the user must be matched (guided) to the call detail record and the charging rate for the call must be determined. After the total charge for the call is calculated using the charging rate, the billing record is updated and is sent to a bill pool (list of ready-to-bill call records). Periodically, a bill is produced for the customer and as payments are received, they are recorded (posted) to the customer's account. This figure shows a mediation system that takes call detail records from several different switches and reformats them into standard call detail records that are sent to the billing system. 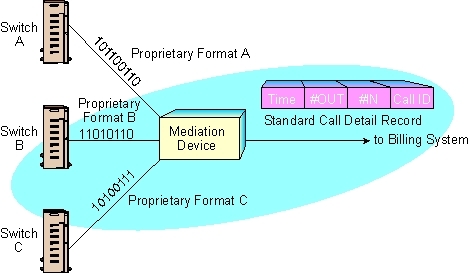 This diagram shows the mediation device is capable of receiving and decoding proprietary data formats from three different switch manufacturers. The mediation device converts these formats into a standard call detail record (CDR) format that can be used by the billing system. This figure shows some of the information (fields) contained in a type 22 CIBER record. 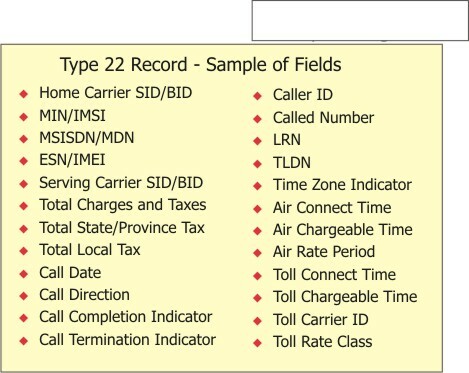 This example shows that the type 22 Ciber record field structure has been updated from the previous type 20 record structure to include additional fields that allow for telephone number portability (enabling telephone number transfer between carriers). This list shows that fields in the Ciber record primarily include identification of airtime charges, taxes, and interconnection (toll) charges. This book explains how companies bill for wireless voice, data, and information services. Billing and customer care for wireless systems convert the measured amounts of services (bytes of digital information transmitted or information services provided) within a network into the money that will be received by the service provider. The billing systems used in wireless systems can vary from simple one time charges for hot-spot wireless access points to integrated mobile cellular systems that allow real-time (near instant) activation and prepayment of services. The authors have interviewed and worked with hundreds of wireless service provider companies to discover the ways wireless billing systems operate. You will learn the language and terms used in the setup and operation wireless billing system systems along with the format and important information parts of wireless billing records. The popular wireless billing industry standards are described and explained including CIBER, TAP3, and IPDR. Covered are the basic processes used to assign costs (rate) to the usage of transmission and information services. Discussed are the ways that charges can be settled between wireless service providers who allow visitors to use their systems. Included is a basic introduction to how services can be instantly provided and how billing is performed for wireless hot-spot services. This book provides a basic introduction to the payment options that may be provided to the customer and how these payment options operate. A basic description of the process to setup a simple billing system is also included.